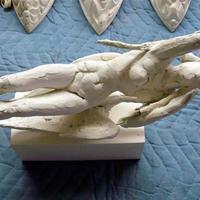 Night figure maquette. 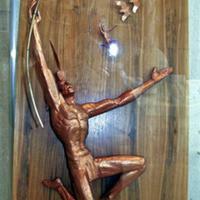 Mounted on wood base. 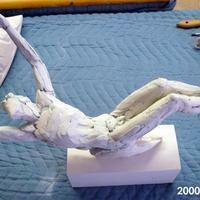 Day maquette plaster figure. Mounted on wood base. 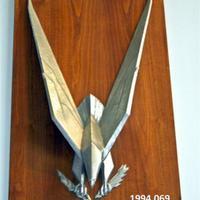 Model for Flying WIld Gulls made from duct tape and metal mounted to a black wood base. 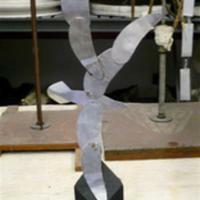 Armature or model for Flying Wild Gulls made of sheet metal. 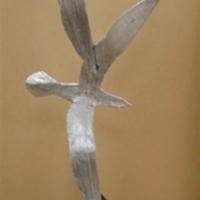 Flying Wild Gulls model made of wire, plaster, duct tape and silver paint on a wood base . Two Sea Gulls in flight. 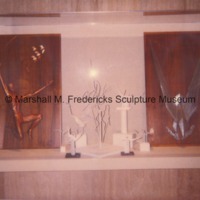 Model for 21 foot sculpture on the John Weld Peck Building, Cincinnati, Ohio. 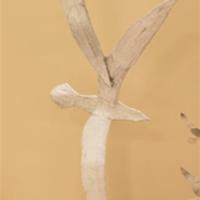 This aluminum eagle mounted on wood, has wings spread and holds in his talons stalks of wheat in one talon and arrows in the other. 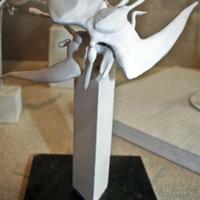 Plaster, sheet metal and metal wire maquette for the Indian and Wild Swans. 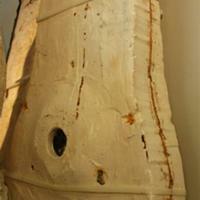 The plaster has been painted a copper color and is mounted on a stained wood board. There is also a smaller maquette on the same board of the Indian with all four swans.